ENERGY-EFFICIENT LitEnergy LED Light Box supplies super bright flicker-free LED lamps last up to 50,000 hours. NO SHADOW, NO GLARE, PROTECT EYES. LitEnergy Light Table provides ideal working lighting environment for penmanship and design. Providing the most comfortable lighting environment for animators, designers, art enthusiasts. children and reader. 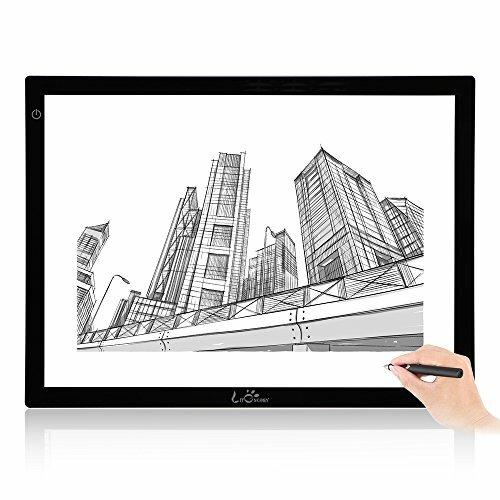 EASY CARRYING LitEnergy Light Panel supplies super thin, super convenient, masterpiece design. WIDELY USED LitEnergy Box Light Tracking uses in Stenciling, 2D animation, Calligraphy, Embossing, Scrapbooking, Tattoo Transferring, Sketching, Drawing, Sewing Projects, Stained Glass, Quilting, Enhanced Visualization and so on.